A few days a go I did a post to download Chris Webby's new mixtape Best In The Burbs. After listening to it a few times my self, I think the kid deserves his own artist profile. Chris Webby is one of the newest waves of rappers looking to bring hip hop back to the top. Lately, rap has been kicking back to life and it is about time. Chris Webby is the next white kid from the suburbs of Connecticut to make some noise. Before you throw out the Eminem and Asher Roth comparisons, I'll state this now: Webby has a different style and approach then both those artists, nor does he sound like them. I saw in one of his interviews that he respects Roth for being the first out of "white suburbia" to really pave the way for other artists like himself, and rightfully so. To date, Chris Webby has released 5 mixtapes in under two years, each free to download and all getting thousands of hits. With each release, he has improved his lyrics, focusing on crazy metaphors and sweet punchlines. He also finds himself on some good beats. He even released a mixtape rhyming over popular songs on the radio like Lady Gaga's "Just Dance." Although he may seem cocky at times, he comes off more confident than anything, which is exactly what people want and need in a rapper. I think what truly surprises me is the kid is unsigned! I am sure that will change as he is so marketable, just look at his social networks (Facebook almost 60k likes) and amount of videos on YouTube. 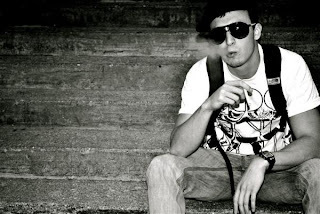 Be on the lookout in 2011 for this kid, it should be Chris Webby's year. Watch some videos below and make sure you check out his free mixtapes.